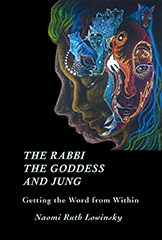 Naomi Ruth Lowinsky creates a sanctuary for the soul in her new book, The Rabbi, the Goddess, and Jung. She shows us the ways in which cultivation of one’s inner life creates sacred space. Admitting that this is not an easy practice in our hectic, fearful times, she demonstrates how the word from within orients—whether it comes as gift or disturbance, guest or ghost, riddle or revelation. It may force a confrontation with one’s worst fears. It may visit in nightmare images, such as the enormous spider with hairy legs and eight baleful eyes that appeared in a dream, come to warn, it would seem, of the perils facing human nature and Mother Nature. It is essential, especially in difficult times, to make space for what the Kabbalah calls “the beyond that lies within—” the still small voice of the Self, the long view of the wisdom traditions. In this collection of poetic, visionary essays, Lowinsky tells stories of the Lady Tree who showed up when she was six, and has wandered in and out of her life, revealing her Goddess nature. Active imagination enables her to work out unfinished business with ancestors including her father and Jung. Dreams introduce her to her spirit guides, and to a dancing rabbi who insists she study Kabbalah. And that scary spider turns out to be Grandmother Spider, a creator goddess who has the power, if we recognize Her, to help us reweave our relationship with earth. Naomi Ruth Lowinsky is an analyst member of the San Francisco C.G. Jung Institute, a frequent contributor to and poetry editor of Psychological Perspectives, and a widely published poet. She won the Blue Light Poetry Prize for her chapbook The Little House on Stilts Remembers. She is the co-editor, with Patricia Damery, of the essay collection: Marked by Fire: Stories of the Jungian Way. Her book about the creative process, The Sister from Below: When the Muse Gets Her Way, tells stories of her pushy muse. She is the author of four full–length poetry collections including Adagio and Lamentation—an offering to her ancestors—and The Faust Woman Poems, which trace one woman’s adventures through Women’s Liberation and the return of the Goddess. She blogs about poetry and life at www.sisterfrombelow.com.